When we imagine great predators like bears, lions, sharks, and the T. rex, they're generally just chowing down on whatever hapless animal wanders in front of them. 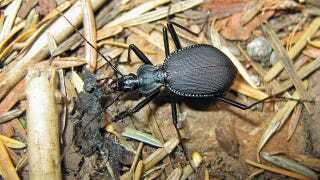 But if beetles are anything to go by, predators have a surprisingly nutritious diet. Until now, scientists assumed that predators didn't deploy any strategy into how they ate, other than simply trying to maximize the amount of calories they assumed. But an international team from the UK, Australia, New Zealand, and Denmark have combined to show that predators are actually much more picky about the foods they eat than previously imagined. To test this, the researchers took a bunch of female ground beetles - a predatory insect that eats everything from slugs and moths to ants and other beetle larvae - and placed them in two separate containers. In one, the beetles were presented with a variety of foods, some high in fat while others were high in protein. The other set of beetles were simply fed whatever the researchers gave them, and none were given the right balance of fat and protein. "At a time of year when many of us are focused on healthy eating, it is interesting to see that predators are also selective about what they eat. Biologists have previously assumed that predators cannot afford to be fussy and that they are simply focused on getting the right quantity of food, rather than quality. We show for the first time that they do actually select the foods that will give them the right balance of nutrients." Via the University of Exeter. Image by GregtheBusker on Flickr.